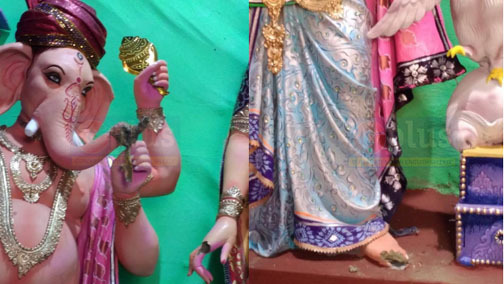 At a time when the Durga Puja committees were asked by the city police to install CCTV cameras in the puja mandaps, unidentified miscreants vandalised the idols of Goddess Durga and Lord Ganesh at New Field puja mandap in Paltan Bazar on Sunday night. According to information, the Durga Puja committee of New Field puja mandap did not install CCTV cameras till Sunday night and taking advantage of that some miscreants damaged the idols of Goddess Durga and Lord Ganesh at the puja mandap in Guwahati. Durga Puja festivities have begun in Guwahati along with other parts of Assam on Monday and the Goddess Durga has been welcomed with Shashthi puja. It may be mentioned that the Commissioner of Police, Guwahati, Pradip Chandra Saloi, during a joint meeting with puja committees held recently, appealed to the office-bearers of puja committees to keep adequate space to accommodate emergency services. “If miscreants try to do any harm to your arrangements for the puja, don’t punish them on the spot; rather, hand them over to us. Again, maintain adequate security around the idols. Deploy volunteers round the clock near the idols. Also, take help of the Food Safety Department to ensure the quality of the prasad,” Saloi said.